The U.S. Coast Guard recovered the body of a missing boater east of Mattituck Inlet Monday morning, one day after he was reported missing in the Long Island Sound, according to the U.S. Coast Guard. Ciro Stellges, 59, of Selden was found at 8:10 a.m. after a search that covered more than 400 square miles. The married father of four called police just after noon Sunday, saying his boat was taking on water three miles off the shore, police said. The 911 call was then used to estimate his position in the waters off Northville, but his body wasn’t discovered for another 19 hours. A Coast Guard spokesperson said Mr. Stelleges was wearing a lifejacket. Members of the Stellges family requested privacy from the media at their Selden home Monday afternoon. A family member said the family has set up an online fundraising page to help offset the funeral costs. As of 8:30 p.m. Monday, the fundraiser has already raised more than $5,000. Mr. Stellges had launched from Mattituck and was en route to Port Washington Sunday, operating a 26-foot fiberglass sailboat named “MAC,” police said. The Riverhead Police Dive Rescue Team and Suffolk County Police Department Aviation and Marine units initially searched for the sailboat in an area near Iron Pier Beach, Riverhead police Lt. David Lessard said. More than two hours into the local search, the Coast Guard took over operations, he said. After discovering the body, members of the U.S. Coast Guard boated into Mattituck Inlet shortly before 10 a.m. Monday, meeting members of the Southold and Riverhead police departments at a DEC boat launch ramp in the inlet. Police officers taped off the area and blocked off public access. 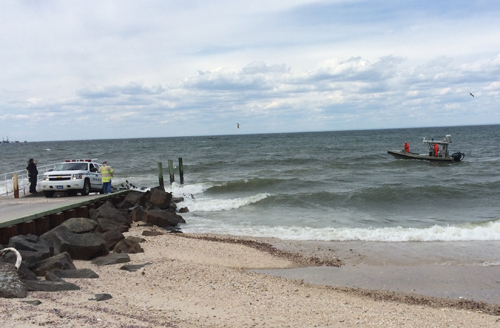 Police were also on scene at Breakwater Beach and Mattituck Inlet Marina on Monday morning. Marina owner Jim Pape said Sunday’s conditions made sailing on the Sound — particularly the south side of the Sound — very difficult. “Yesterday was not a nice day,” he said. Mr. Pape added that on days with a north wind, sailing near the Connecticut coast is preferable, whereas when a southern wind is blowing, sailing across the Long Island coast is easier. Sunday’s winds were blowing from the northwest. The National Weather Service issued a small craft advisory from Sunday through 11 a.m. Monday to alert boaters of the conditions. Mr. Pape said winds over 10 knots make sailing difficult on the Sound; gusts of up to 30 to 35 knots blew on Sunday, he said.